The Animal is certainly someone who will be in the Hall of Fame soon. With Batista's defeat at WrestleMania 35 at the hands of 'the Game', Triple H, he now feels that his career has come to an end. When talking with Lillian Garcia on her podcast, Chasing Glory with Lillian Garcia, Batista mentioned that he will be inducted into the WWE Hall of Fame and that he has already asked someone to induct him. Fightful carried transcripts of 'the Animal's' interview. After much success in the WWE that started as a member of Evolution, Batista 'quit' the WWE twice and found more success in Hollywood. He always wanted one more match against Triple H, and he got it at WrestleMania 35 where he ultimately fell to his former stablemate. After the show, he said that he was done in the ring. Batista's reasoning behind his attack on Ric Flair at Flair's 70th birthday celebration on Raw was that he was trying to get Triple H's attention. The Animal had always wanted to close out his WWE in-ring career with a final match with The Game at WrestleMania. He got it this year and even wanted Triple H to put his career on the line. The Game obliged and ended up defeating Batista at The Grandest Stage Of Them All. When speaking with Lillian Garcia, she asked him about about his thoughts about eventually being inducted into the Hall of Fame. "I've already asked someone to induct me. I will go into the Hall of Fame," said Batista. "I don't know if it'll be next year or the year after, eventually I will. Vince has talked to me about it years back. And the reason I said I wasn't interested (is) because I didn't feel like I had closure in my career. When I'm ready to hang up my boots is when I'll go into the Hall of Fame." The closure he referred to was a final match with The Game at WrestleMania and that has come to fruition. Since that request has been fulfilled, Batista feels content with his career as it now sits. 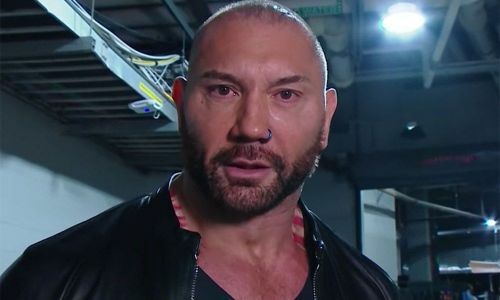 But being an entertainer as well as a professional wrestler is special to Batista because of the acknowledgement of the accomplishments and the fans. Depending on if WWE has even thought about next year's ceremony, Batista would certainly be a worthy headliner for the Class of 2020. For Batista, his movie career is on the fast track. He'll be appearing in Avengers: Endgame at the end of the month and a remake of the movie Dune. For the fans, we've seen the last of The Animal in the ring but not in the WWE if he's inducted into the HOF.